My husband is home - though still on crutches. But at least if something goes wrong with the car, he can help me (he's an excellent mechanic). So, now maybe I can focus once more. 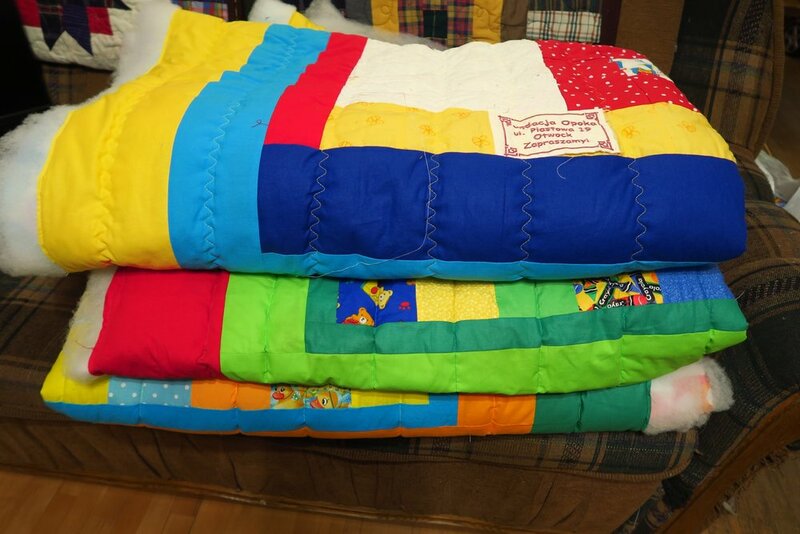 This is not a pile of 50 quilts.It's probably between 40 and 50, though. I have some in the sewing room right now and some were just outside the door of this room when I took the picture. You can pile sandwiched quilts only so high before they fall over. I started on quilting those charity quilts Lydia and I sandwiched. I managed to quilt 2 today and carried all three downstairs, ready to trim. Am I ready to trim? Hmmm. When I trim, guess what happens? If you said, "You get more leftovers/trimmings!" you would be right. So, am I ready for them? Not really, but I've got to get going on these. The first three quilted. 3/57! Lydia quilted one and 1 quilted 2 today - they don't take too long since I'm just doing straight line quilting on some of the kids' ones. I am going to try some FMQ on what I consider some of the nicer tops tomorrow. I'm going to aim for 2 a day until I get these done. Maybe I'll up it to three, but 2 is going to be my minimum. Every time I get 10 or so done, I'll stop and take a group shot and take them to the church building to keep them out of the house. A picture of 50 looks mighty impressive, but it means I have to deal with more than I want to at one time! I'm trying to get a handle on the "clutter" in my house. That's one other thing I'm doing - trying to declutter. It means, that while I can just either throw it all away, or just find bins to put it in, I'm actually somewhat trying to make good decisions about where this stuff goes. For example, I've got a few quilts that are well used in my house. What to do with them? I seem to make them pretty fast, so I've always got more in the works. But my husband has said he could use 4 or 5 more for his shop - the better ones to lie on under vehicles if he's working on the ground, and the worst/grungy ones for covering things. So, I picked out 5 for him to have. I still have several that are well worn and I don't want in my own home anymore. This is the same pile of quilts as on the left - just stacked neatly. 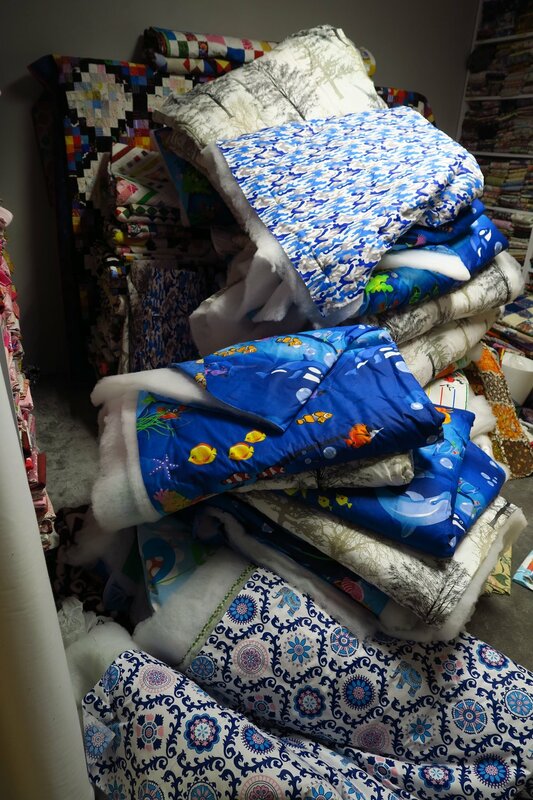 Some people probably think it's bad to do this, but the quilts headed for the work area - let me explain them - 1 - top blue one - was actually just two pieces of fabric sewn together with batting in the middle. No quilting involved. I bound it as best as I could figure out. My very early "quilting" effort. 2. a church made the blue and red one for us. This is the best one of the lot - there's nothing wrong with it - just that those were small boys back then - but now they are grown men - may move this one out of this pile and give to the homeless if I can find one in worse condition 3. a tied quilt I made with animals. We used it on our bed. The fabric that is closest to the face is pilling. Obviously I used cotton/polyester in it - it was second hand fabric, I'm pretty sure. Anyway, it's not comfortable at all to have by your face now. I told my husband that this one can go on the ground when he works as it has extra thick poly batting in it. it's a tied quilt - a very early one of mine. 4. a very pretty white and pink quilt I bought at JC Penney's for $20 maybe 18 years ago. They (I bought 2) started falling apart when the girls washed them the first (maybe the second?) time. The seam allowances are so narrow they are impossible to fix. and 5. a black denim one I made. It was in a wet place for too long and grew mold. I washed it two times in hot water - the last time with bleach. When I laid it out to dry on the table, I noticed quite a few holes in it. I guess bleach might not have been a good idea. It's very sturdy though and I don't feel like "repairing" it. It's also tied - one of my very early quilts. It will be fine in Mike's workshop. I'm frankly not sure what to do with these early rag quilts. I made them about 10 years ago from mostly second-hand pjs I found locally. If I can't find a home with some Facebook friends in Poland, they will probably head to downtown Warsaw for the homeless. They are so soft and comfy! And warm! I made about 7 of them after collecting flannel pjs for about a year - I went almost weekly to the second-hand shop to look for flannel in good condition, but "cheap". I've got all this going on at the same time - the charity quilts, my own decluttering efforts - I'm trying to rid the house of a bunch of excess stuff that we no longer need and hopefully let it go to people who can use it - then, of course I've got my blues project and a whole pile of quilt tops to quilt - non charity ones - just ones I've made "just because". I've certainly not run out of something to do! Plus, I've taken it on myself to try to learn my Canon G7X camera better. It can do a lot and I know almost nothing about it. My laziness with regards to "learning my camera" has got to come to a stop! I want to be able to take better pictures. Daniel's not around! But other than all that, I've got nothing going on! And just in case you need something for your own quilting, be sure to check out what my sis has for you! Surely she's got something you need! Did you realize she carries second hand books? Yes she does!